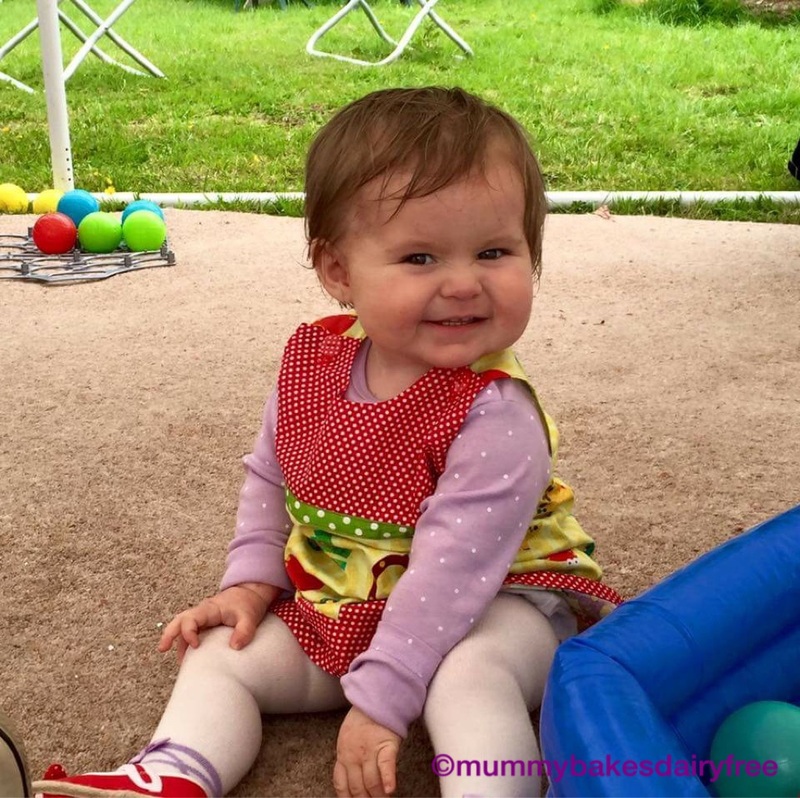 An amazing week celebrating little one’s first birthday! 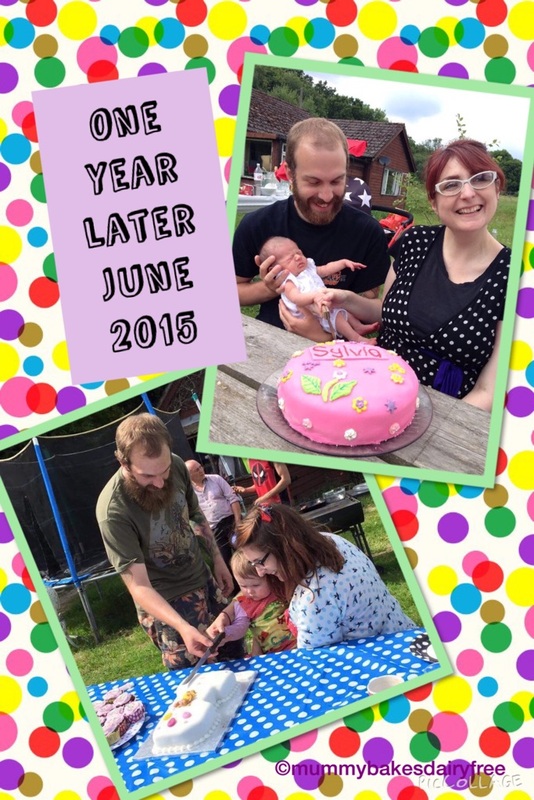 I can’t believe it has been a year already and what a fantastic year it has been. We celebrated on Saturday with a BBQ for family and friends. 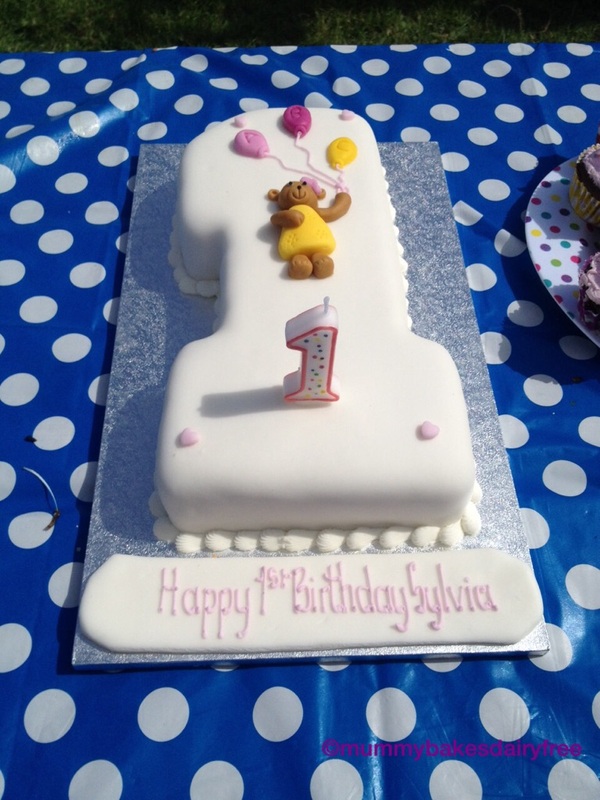 It was lovely for little one to be surrounded by aunties and uncles, great aunties and great uncles, grandparents, great grandparents and even her great great nan, who celebrated her 100th birthday earlier this year. The weather came through for us (much to mummy’s relief!) and little one had a brilliant time partying with her little friends. She enjoyed it so much she went to bed without a fuss and she slept through the night, woohoo! Mummy and the birthday girl! The BBQ was a hit. With the excitement of lots of people and a small ball pond, little one wasn’t too interested in eating, however she did really love the sausages. 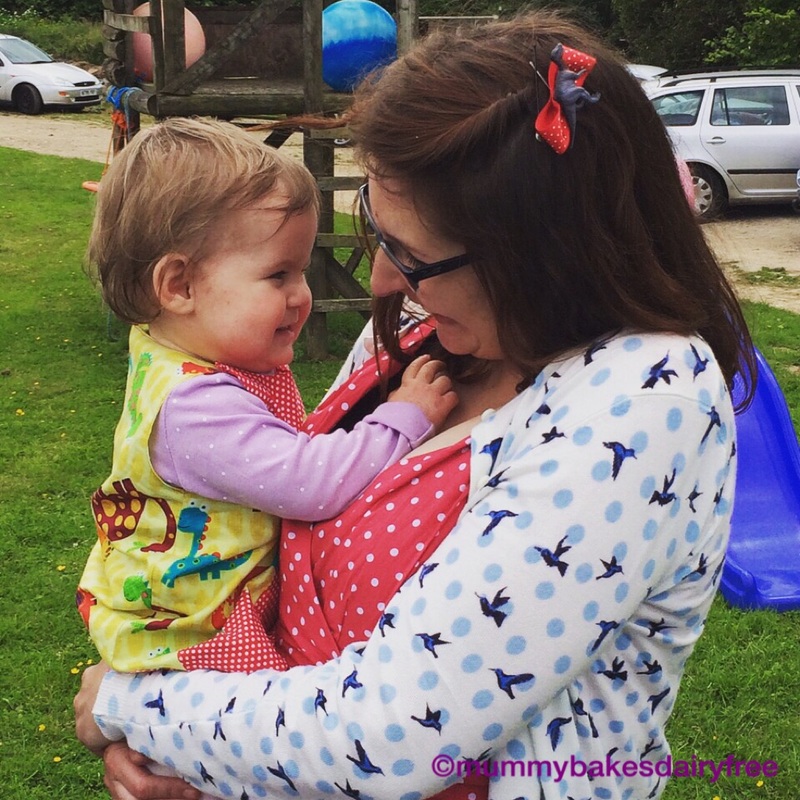 I found looking for a range of allergy friendly food time consuming yet easier than expected. As always fresh and homemade was safest but I did make some new food discoveries which were a success with little one. Tesco’s original Italian breadsticks are dairy free and went down well, especially when dipped in hummus. The hummus was shop bought but it is so easy to make that it’s on my list of things to try. Dairy and egg free burgers and sausages were readily available from Tesco and I came across a range of gluten free burgers and sausages by a company called Heck. 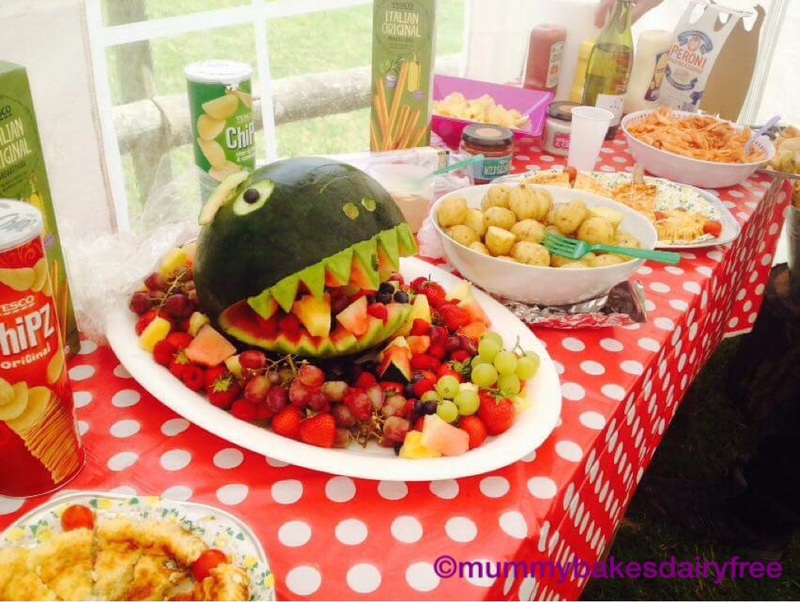 Little one’s uncle made a brilliant watermelon dinosaur fresh fruit platter, which was much appreciated as the weather got warmer. For the cake we had a rather yummy number one cake by M&S. I also made some very allergy unfriendly chocolate cup cakes with a dairy filled buttercream frosting. Unfortunately they did begin to wilt slightly in the heat. Luckily they still tasted pretty good. Little one’s dairy and egg free cupcakes faired much better in the weather and were enjoyed very much by the birthday girl. I finally found a recipe which I could tweak to suit little one’s dietary requirements and tasted really good. I’ll post the recipe soon. In the commotion of a first birthday and mummy having a night out (I went to see Take That at the O2. They were amazing. I’m sure they get better each time I see them.) 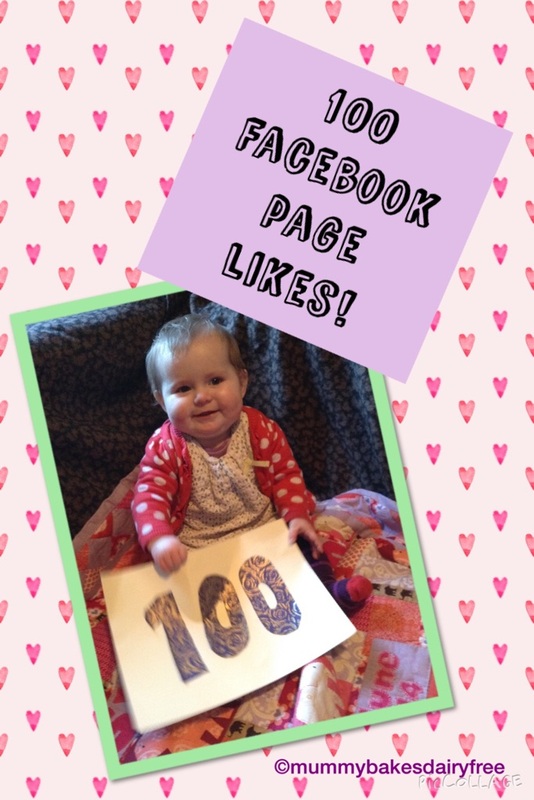 I forgot to say thank you for over 100 Facebook page likes. If you haven’t done so already, please check out my mummybakesdairyfree Facebook page. Apologies for no new recipe today. I’m looking forward to trying out some new dairy, egg and nut free recipes now that things are getting back to reality. So keep checking back or keep up to date through my Instagram @mummybakesdairyfree, Twitter @bakedairyfree or my Facebook page mummybakesdairyfree. Thank you to everyone who has helped make little one’s first birthday one that her daddy and I will never forget. I look forward to showing her the photos (and embarrassing her) when she’s older!! What a cute face – Happy Birthday! Aww thank you. She is a cutie! !